8.00 " x 8.00 "
Neither Jessica Stout nor her father, Walter Horak, set out to publish this book, both authors wishing foremost and forevermore that there had never been a reason. Yet love for a little boy compelled them. 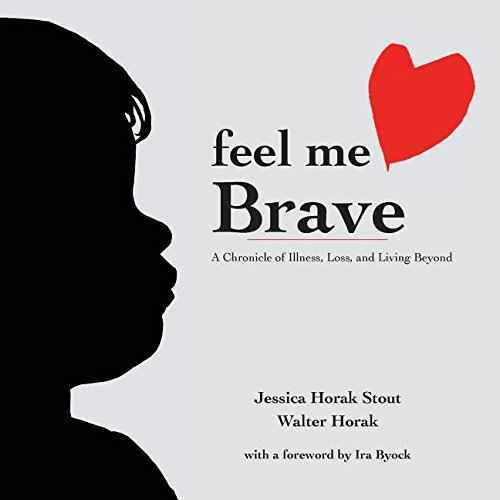 FEEL ME BRAVE began as a blog by Jessica to keep her family and friends abreast of her young son's struggle with an incurable disease. But the power of her prose-unflinchingly honest, piercingly insightful, and on occasion startlingly humorous-settled deeply into the hearts of people following Ryland Stout's journey. Caught up in the same struggle, Walter began to write poetry as he groped for a way to express a grief that tormented his entire family, even as each day brought them closer to that inevitable moment of parting. Over time, the idea took hold to merge the words of father and daughter into unique, shared testimony. And readers urged that it find a wide audience, especially those facing serious life challenges or simply contemplating its difficult mysteries. The result is this remarkable book, a "treasure" in Dr. Ira Byock's estimation. Heartbreaking and uplifting in equal measure, FEEL ME BRAVE invites you to open your own heart and to dwell a while within those deep places that make us all more fully human.